Personal computers have come a long way since their introduction at the end of the 1970’s. They are now quite powerful machines with retina displays, increased performance, and abundant data storage. So naturally, physicians who work with medical images gravitate toward their PC as a way to save money rather than purchase an expensive purpose built medical imaging viewing station from one of the big name vendors. When you compare the capabilities of desktop viewing software like OsiriX or Horos to more expensive viewers, most physicians will find that these programs do just fine and that the extra expenditure is not warranted. We agree. In fact, if you want to see even sharper images, invest in a large high resolution monitor rather than a purpose built workstation. You can find a great monitor for less than $1,000 USD nowadays. However, storing studies on your trusty PC is probably not the best idea due to one simple fact: there’s simply not enough room. Should My PC House My PACS? If you chose your PC as a viewing station, then a logical question arises as to whether to just use the PC as a complete PACS. With PC storage regularly exceeding a quarter of a terabyte, why not just keep the electronic files of your medical images right there? After all, the viewing software comes with the ability to store your studies locally. So with that viewer functionality and the available storage on your PC, there should be plenty of room, right? Well, we did the calculations and even with storing high resolution MRIs and CTs, a quarter of a terabyte of storage (250 gigabytes) can comfortably house about 1,250 studies. Hence, if you storing 25 new studies each month, that space could theoretically last you more than 4 years. You’re probably wondering at this point, “So, what’s the problem? You’re telling me my PC has the capability to do what I need. Why should I even bother to change the way I currently store studies?” It’s a valid question, and many have asked it before. Here’s why we recommend that you don’t fall into the same trap…. The ugly truth is that your PC’s hard drive and solid state storage (SSS) are points of failure. If your drive or PC crashes, all of the images you have stored are at risk. Of course you could back them up regularly to protect them. But most of the health care providers we have encountered either fail to regularly backup their data with a reliable method, or fail to test those backups to ensure they are recoverable. In light of that experience, we suggest that you not use your PC as a PACS. An alternative to storing medical images on your PC is a relatively inexpensive on-site PACS. You should be able to find an affordable configuration at the smallest end for less than $2,500 USD. -Even the larger systems can all be purchased for less than $5,000. Typically these are comprised of a computer server connected with direct attached storage in the form of a RAID. This system would run the PACS software along with a SQL database to store your images. However, do note that the size of your RAID is dependent upon the volume of images you are planning to capture. Below is a table that we created for typical monthly and annual usage along with the recommended RAID size. You should note that due to the “redundancy” inherent in a RAID, not all of the space is “usable” for storage of studies. Those calculations are built into the chart below. While a standalone PACS is far better than using your PC, we always suggest that you backup your RAID as well. Despite the disk redundancy, we are not fans of having all of your data in one geography, no matter how resilient it is. You should always be prepared for any type of disaster: natural or man made. Good procedures include automatic backups set on a regular frequencythat send your data to another location. In fact, the Cloud is a great facility for backing up your PACS. There is nothing wrong with using a solution that works for you. If OsiriX or Horos fall into that realm, then that’s great! All we advise is that you take the time to consider the risk. Technology is not perfect, and if you leave your PC to work as your PACS without a sufficient backup strategy, you’re tempting the permanent loss of your data. PCs are powerful machines, but they were not created to hold large amounts of data forever. For one, their lifespans are quite short. Additionally, they can break, be lost or even stolen. If that happens, you lose your data forever. And if your preferred desktop viewer is the only reason you really want to use your PC as your PACS, you have been misled. 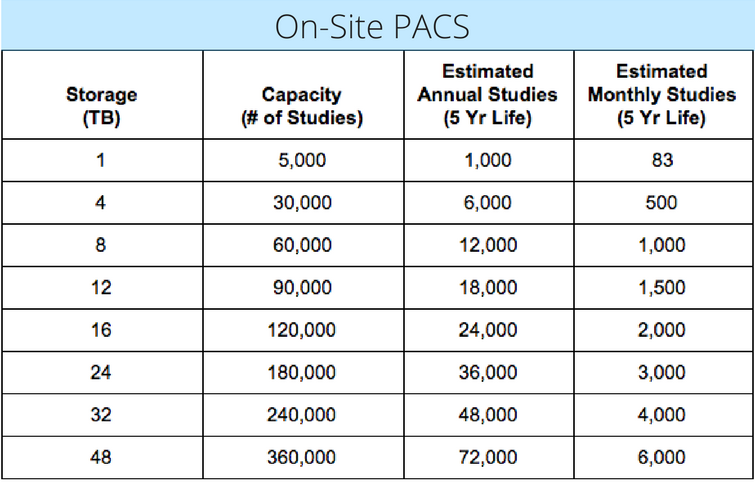 For a small cost, you can upgrade to an on-site or Cloud based PACS. The latter of which will allow you the ability to share and access your medical images anywhere in the world. So even if you left your PC at the office, you can view your studies from your couch on your personal tablet….Now isn’t that a nice thought?